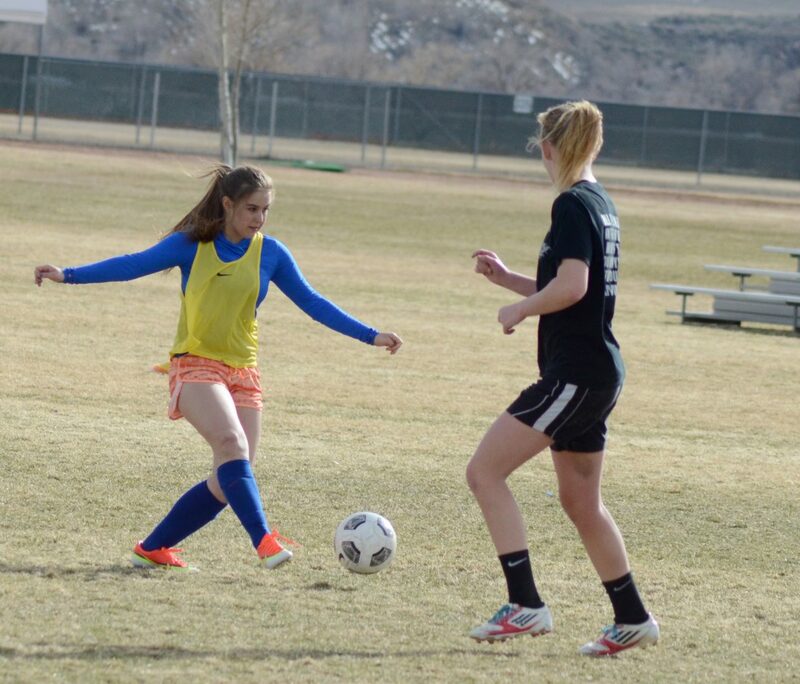 Alex Hamilton makes a pass during Moffat County soccer practice last week. The Bulldogs picked up their first win of the season by beating Vail Mountain, 2-1, on Tuesday in Vail. Riding on a strong first half, Moffat County’s girls soccer team picked up an important win — its first of the young season. Playing a rescheduled game against Vail Mountain that was supposed to be in Craig on Saturday, the Bulldogs instead traveled to Vail on Tuesday afternoon. They got off the bus and picked up a 2-1 win, improving to 1-2 this season. Moffat County took a 2-0 lead in the first half on the strength of goals from seniors Allie Ehlers and Brenna Ciesco. Ehlers scored on a free kick from near midfield, her second goal of the season. Later in the half, Brittany Walker found Ciesco with a pass, and the senior turned toward the goal and pushed it over the VMS keeper’s head. The Bulldogs controlled most of the game in the offensive half and probably could have gone into halftime with a bigger lead, Tripp said, but they couldn’t finish on all their chances. In the second half, a lapse of focus allowed Vail Mountain to pull to within one, but the Gore Rangers were unable to equalize the game. Moffat County picked up its first win of the season, and after two games were postponed last week, it has a chance to enter spring break with an even 2-2 record if it can beat Rangely on Friday.